What a detective you are! I’m so glad you found him and wrote this piece. Sanjay has made quite a few comments to my blog as well, so it is indeed nice to learn a little something about him. Thank you so much. And Sanjay, she found you! I was really worried that everyone else knew he was. Glad to know that there are others out there. Sanjay is a great guy - he and I have even spoken on the phone about the concept of data successorship and why it is important to all computer users, not just genealogists. I hope to have a review of the Virtual Lockbox product posted soon! Good detective work! He drops nice comments on my blog too. Nice to know who he is and what he does. Comment from Sanjay, left on http://aaagenealogy.blogspot.com (mirroring website). 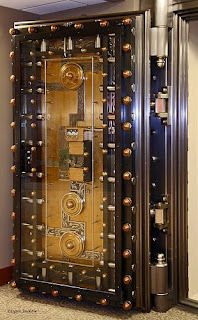 Thanks Kathleen for your post and mentioning me and Virtual LockBox on Follow Friday. You are absolutely correct that one cannOt predict when we will go so in a way it is difficult to assign a date on our Virtual LockBox concept when the information can be released to your loved ones. Our date driven aspect is more for a date you know of such as a milestone coming up, perhaps a grandparent would like to pass on their genealogy research to their grandson or granddaugher who will turn say 16 in 2015, so that is a known date and that is what the date driven aspect is for. We also have an option called event driven and this option is geared precisely for the unknown date. Ahhhhh! Good work, Sherlock! (lol) Thanks for "outing" Sanjay to the rest of us. He has made a few very kind comments on my blog, and I've wondered who he was, but did nothing to find out. I love the Virtual Lockbox idea! I actually listened to a piece about a company that does this on NPR a couple of weeks ago. (It could have been Sanjay's. I don't recall the name.) It's definitely something to consider, isn't it? I guess quite a few of us didn't know who he was. Again, good piece. Thanks guys for stopping by and meeting Sanjay "formally". Thanks Sanjay, I should have featured you though on a Treasure Chest Thursday. You are a treasure. Great detective work. I enjoy reading his comments and always wondered who he was. What happened? I cannot find a website for Virtual Lockbox or ShareMyLife Inc through a Google search. Thanks for this note. I just sent a note to Sanjay on his whereabouts. This was a great product, so hopefully it did not go by the wayside! Will keep you informed.